The Gold Coast branch is on North State Street, directly opposite my old favourite, Tempo Café. Another of the branches, in the Loop, is a merely five minute walk from my office, both new additions since I was last in Chicago this time last year. The Gold Coast branch is at the bottom of a residential apartment block and while the apartments have their own separate entrance at the back, it’s very much a stand-alone operation. Long and thin, the narrow store front looks across the street at Tempo. The door’s slightly inset on the left, with three large floor-to-ceiling windows on the right, occupied by a four-person window bar, ideal for people-watching. Much of the interior’s occupied by the counter, set back on the right-hand side. Narrow at the front, it widens slowly as it goes back. There’s a bar chair at the end, looking along the counter’s length, with three more along the left-hand side, where you can chat with the baristas and watch the pour-over being made. At the end of the seating there’s an EK-43 grinder for the filter coffee, then comes a bright orange (Big Shoulder’s house colour) three-group La Marzocco Strada espresso machine. This is followed by a Mahlkönig Peak grinder for the house espresso and Mazzer Super Jolly for decaf, with the bulk-brew flask for the filter coffee also taking a spot on the counter, so customers can help themselves to the fast drip. The actual brewer, plus boilers for the pour-over/tea, are on the wall behind the counter. The till and a display case for the cake are at the end of the counter. The remaining seating is on the left, a padded bench running along the wall with four round, two-person tables in front of it. This stops short of the back wall, leaving space for some retail shelves and a refrigerated cabinet for the soft drinks. There’s another set of retail shelves, this time for bags of coffee, on the back wall, while the door to the apartments is in the left-hand corner. I started with a cappuccino, made with the house blend. This was a lovely coffee with plenty of body, going really well with the milk. My cappuccino arrived with a glass of water and even though I was sitting at the counter, Tim didn’t just hand it over, but instead came around and handed it to me, a nice touch, particularly given that I was, at that point, just another customer. I had a chance to introduce myself just before Tim had to go, leaving me in the capable hands of Lauren, the manager. She pulled me a shot of the house-blend to try, which was every bit as good as I’d hoped from the cappuccino, a lovely, well-rounded espresso. She also made a V60 of a new coffee, an organic Ethiopian natural, and let me try some, which was very kind. The coffee smelt absolutely gorgeous after grinding, with a really big, fruity hit. In the cup, it didn’t disappoint, the rich fruitiness really coming through as it cooled. An excellent coffee, it’s one of the best I’ve had, and expertly brewed, Lauren telling me that Big Shoulders prides itself on its pour-overs, slowly converting Chicago folks away from fast drip and into the slow lane. Conversation drifted onto my book, The Philosophy of Coffee, and Lauren, who had been an area manager for Cartel Coffee Lab in Arizona before moving to Chicago, instantly recognised it, having seen one of the copies I’d left in Phoenix earlier in the year. The speciality coffee world really is very small at times! 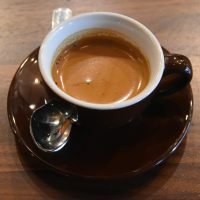 This entry was posted in Cafe/Roaster, Cake, Chicago, Coffee Shops, Evening Opening, Laptop Friendly, Retailers and tagged Chicago2018, include, USA2019-01 by Brian Williams. Bookmark the permalink.